Pop diva Christina Aguilera fragrance for 2012 is named Red Sin. Christina Aguilera is currently giving away stylish branded key chain. 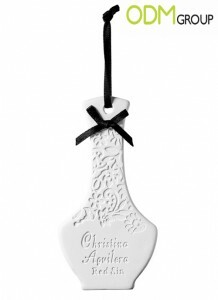 This is a promotional gift which customers will get with every purchase of Christina Aguilera’s new fragrance. This branded key chain is an effective way to popularize your brand amongst you target audience. Using branded key chain is a simple and practical promotional product strategy for any business. How can this branded key chain improves brand awareness? One thing that every prospective customer you meet needs to look at every single day of their life – it’s their key and with branded key chains, you can boost brand awareness. And every day, when your prospective customer opens his front door, they will see your company’s logo. These small and useful promotional items will serve as a constant brand reminder of your company and brand offering. Branded key chain has a fantastic durable working life for a very low price. Due to their small size and durability, branded key chain can be easily mailed to your customers or included as a give with purchase product. Giving your employees a branded key chain for use around the store or office adds a mark of professionalism and prestige. Furthermore, branded key chain can be manufactured from different metals, plastics and even leather, wood or glass. Branded key chains also come in vast range of shapes, designs. A popular choice is to choose is a branded key chain with a small LED light. And no matter what style and color you choose, your logo is certain to look great for years. Подаренные рекламные брелоки станут постоянными аксессуарами деловых партнеров или клиентов Вашей компании. Таким образом, при каждом использовании ключей, логотип компании будет ненавязчиво напоминать о сотрудничестве с Вами. Выпуск рекламных брелоков с логотипом компании – это проверенный способ распространения информации об организации.